I think what I like best about solar observing is you never know what you will find going on! This large prominence at the eastern limb appeared extraordinary in its detailed and lacey appearance. Seeing was very good and at higher magnification a network of bright areas appeared, much like a picture of a neuron cell with branching filaments extending in all directions. Tilting Sun Graphics are used to denote prominence location. Webmaster’s note: ASOD is experiencing problems with sketch submissions where the file size exceeds the limit of the ASOD WordPress programs capability to process the file. Please be aware that when this occurs, although we do have some graphic editing programs, large files will result in two or three iterations of resizing, that may still result in a sketch that cannot be downloaded to the ASOD template. Due to the fact that I have a day job, I often put these pages together late at night, and being very tired I have difficulty trying to bring these posts together. Please be aware that we would prefer receiving files that are no bigger than 800 pixels wide. We will always resize your sketch image to 650 pixels to fit on all the the standard protocols for tablets and smart phones. Please make sure the image file size (the number of bytes the image file) contains does not exceed 500 Kilobytes. This will guarantee that your sketch is published in it’s entirety, and on time. If there are any questions, please feel free to contact us here at ASOD, we will be happy to help with any problems that are troubling you with image size issues. Today the clear night with a north wind and cold stayed and had to take before they come clouds in the coming days to observe this comet that can already be seen with the naked eye in the constellation of Taurus and soon passed north . Today was much better appreciated his tail and was a joy to watch is 30mm eyepiece. With 1.6º field. Asin and all the drawing I’ve had to make split it did not fit into the eyepiece 1.6º. Its nucleus is bright star with a magnitude of 4.0 and its tail and 3rd round long. Vos advise that you observe when you can these days because every day and be farther from Earth. These are the ephemeris for the remainder of the month. 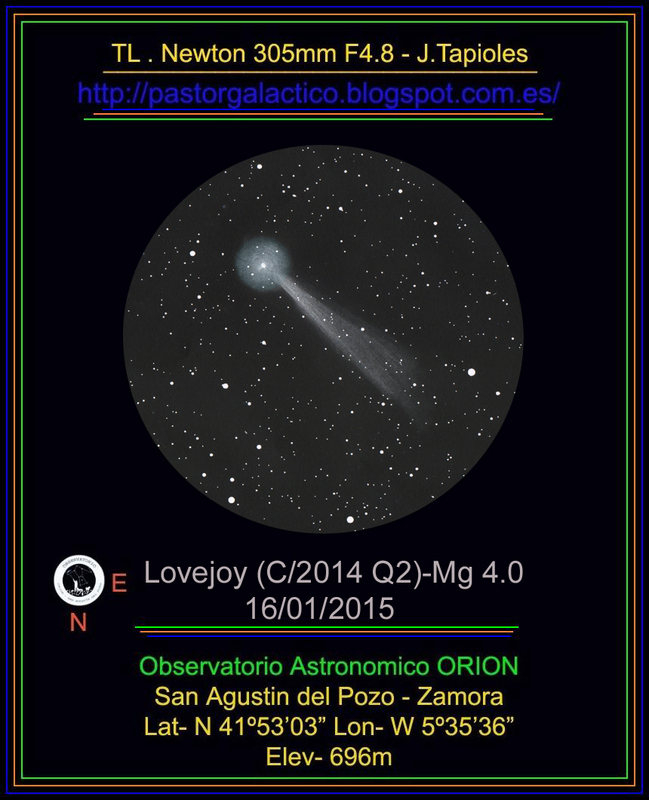 From the looks of the ASOD webpage, Comet Q2 Lovejoy is getting the attention it deserves from observers around the globe. Some really fine sketches are here. I did this high magnification study of the comet using my 35cm Schmidt-Cassegrain telescope under the dark, transparent skies of wintertime rural Appalachia. Even using my lowest magnification eyepiece to give the widest field of view. the head of the comet and the beginning of the ion tail and the dust tail filled the field. The short fan shaped dust tail stretched from about PA 100° to 170° and was hard to differentiate from the coma. The longer ion tail at PA 80° was highlighted with streamers and extended outwards for several fields. The very bright pseudo-nucleus was flanked by two background stars. 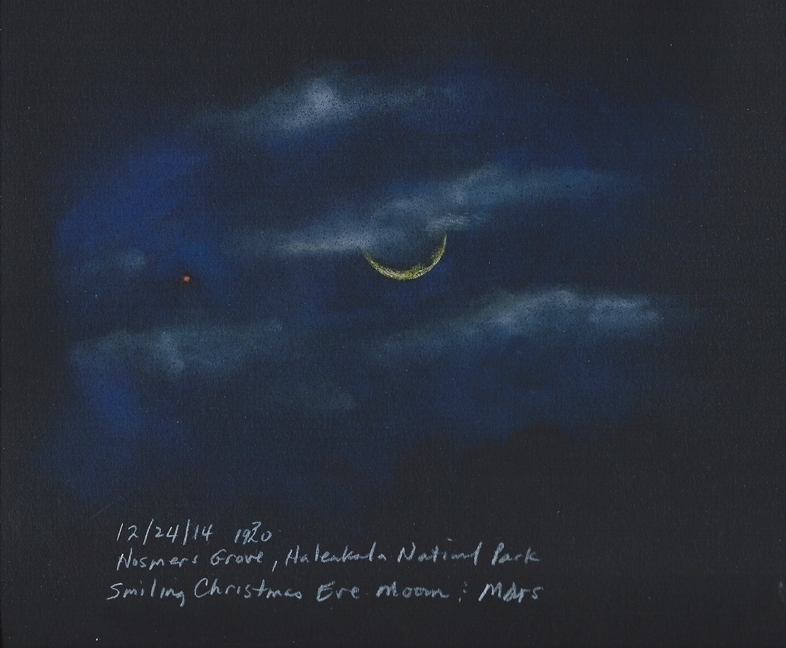 The moonless night was chilly, 21°F (-6°C), so I did the sketch from field notes immediately after coming indoors. A blending stump loaded with 2B or HB graphite was used for the coma and tail with additional blending with my finger. The stars were made with an HB pencil. I tweaked the gamma when scanning and flipped the drawing during processing to give the correct image view (north up/west to the right). 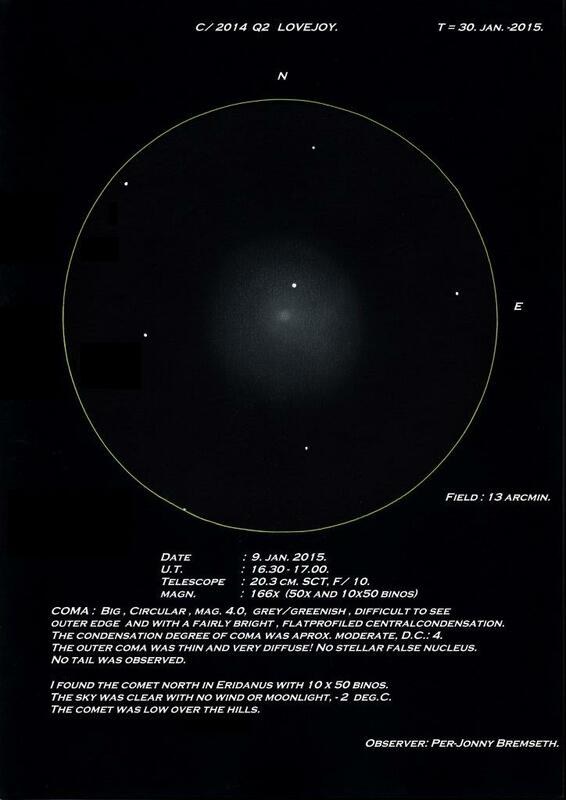 I expect astrosketchers will continue to have fun with this comet–it’s a nice one. will be reported very, very soon! (lápiz de grafito, papel blanco, escaneado y invertido el color. Esta tarde estaba medio despejado y había que aprovechar antes de que se acercaran mas las nubes y que en los prosimos días no nos dejaran observar. 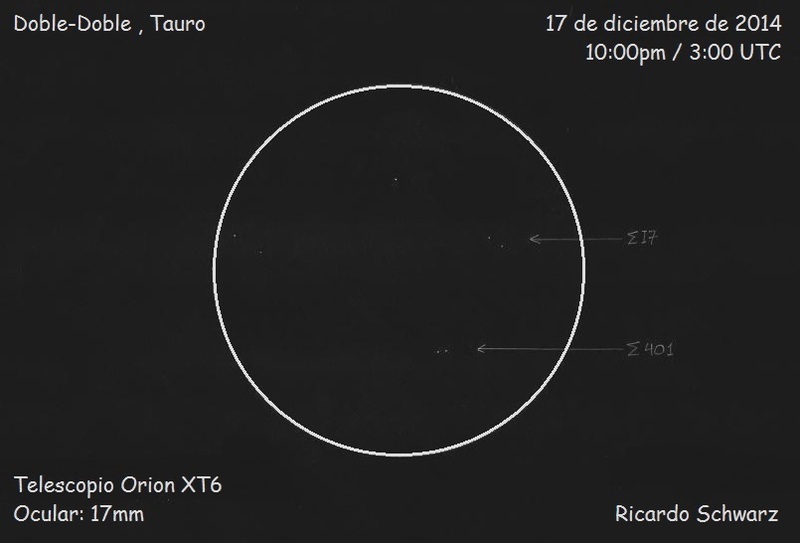 Hoy prepare los bártulos para dibujar al C2014 Q2 Lovejoy y me puse sobre las 19:15 TU a observar el cometa con el 12″ primeramente su núcleo y su gran coma que tiene unos 17 minutos de arco con el ocular de 8mm ES para ver si había algo raro en su núcleo por si empiezan a salir chorros como fue en el caso del Halo Boop, que disfrutamos muchos aficionados ya en el año 1997, si ya ha pasado mucho tiempo pero yo aun recuerdo esos chorros de gas saliendo en espiral del núcleo del cometa. Bueno en fin que no se veía nada raro a no ser por un pequeño tono azulado verdoso que parece desprenderse de su núcleo y después de captar este pequeño detalle empece a dibujar por partes el cometa empezando por su núcleo y coma y mirando aun por el 8mm ES, es una gozada estar dibujando y que el objeto no se te marche de parranda luego gracias al picgoto de Angel Caparros. Dibujar la coma es mas o menos facil, pero otra cosa a sido su cola. Primero tuve que cambiar de ocular para poder abarcar todo el campo que me permitiera y lo masimo lo logro con el 30mm ES – 1.6º por lo que hay que dibujar la cola por partes pues 2.6º de cola es mucha cola para este ocular y este telescopio de 12″ F4.8. Primero estoy un rato moviendo el tubo en altura para arriba y para abajo pera ver mejor hasta donde llega la salida de la cola y me refiero a su anchura pegando al cometa. Los detalles son muy sutiles por lo que antes de plasmar algo en el papel hay que asegurarse desde donde a donde llega esa cola a su salida del núcleo y asín lo tuve que hacer durante 3 veces hasta conseguir plasmar toda su cola. He de decir que los detalles son muy sutiles y hay que estar mas de 2 minutos observando detenidamente para que esos pocos fotones de luz se queden en el cerebro para luego plasmar eso en el papel. Cuando he terminado me doy cuenta que el cometa se ha movido unos 5 minutos de arco desde que empece el dibujo, osea que mas o menos he estado con el 1 hora. El cometa esta en Mg 4.0 viéndose perfectamente a simple vista desde mi observatorio que la calidad del cielo ronda la Mg 6 en visual. Parece que hoy he tenido mucha suerte ya que terminado de plasmar el cometa en el papel ya empezaron a meterse nubes. 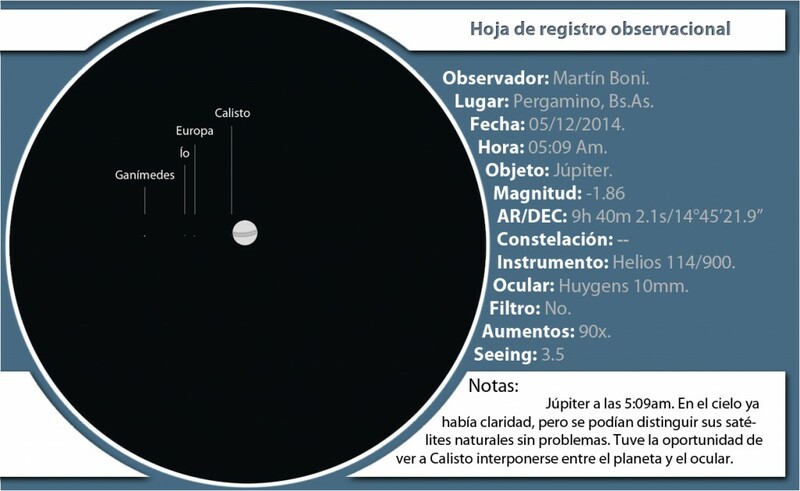 Como veréis el cometa esta dibujado sobre una carta estelar del GUIDE 9.0 pues no me gusta dibujar tanta estrella cuando lo que quiero es plasmar un cometa. (graphite pencil, white paper, scanned and inverted color. This afternoon was half cleared and had to take before they come out more clouds and in the days Forthcoming not let us observe. Today prepare gear for drawing the C2014 Q2 Lovejoy and got about 19:15 TU to observe the comet with 12 “first nucleus and large eat has about 17 arcmin with ES 8mm eyepiece to see if there was something strange in your kernel if they start out jets as was in the case of Halo Boop, who enjoyed many fans already in 1997, if it has been a long time but I still remember those gas jets out spiral core comet. Well in order not seen nothing unusual except for a small greenish blue tint that appears from its core and then to capture this small detail parts started to draw by starting the comet nucleus and coma and looking even by 8mm it is a joy to be drawing the object and do not leave out partying then thanks to picgoto Angel Caparros. Draw the comma is more or less easy, but otherwise been his tail. 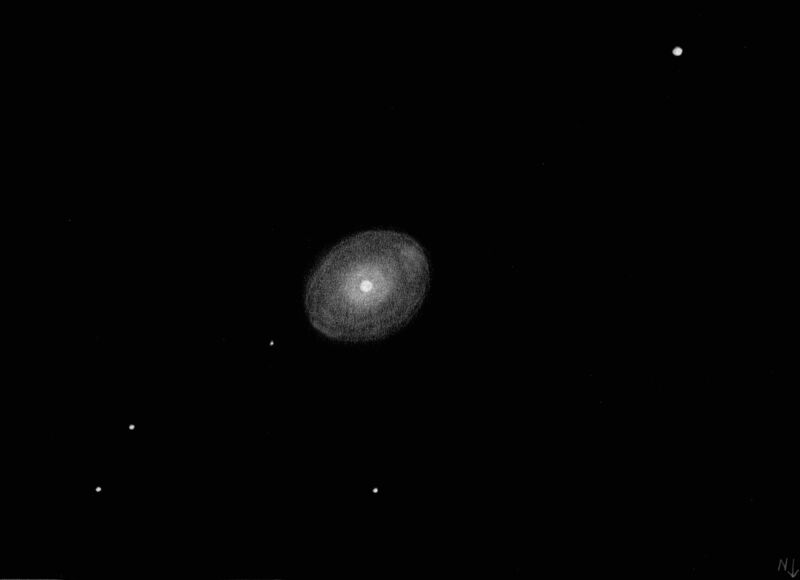 First I had to change eye to cover the whole field to allow me and masimo I succeed with 30mm ES – 1.6º so you have to draw the line for parts as 2.6º tail is long queue for this eye and this 12 “telescope F4.8. First I’m a bit by moving the tube height up and down pear see better far off the tail comes and I mean width hitting the comet. The details are very subtle so before translating something on paper make sure from where to where that queue reaches its core outlet and asynchronous I had to do for 3 times until capture all his tail. I have to say that the details are very subtle and we must be more than two minutes watching carefully for those few photons of light left in the brain and then translate that into the paper. When I’m done I realize that the comet has moved about 5 arcmin since I started drawing, I mean that more or less have been with the 1 hour. 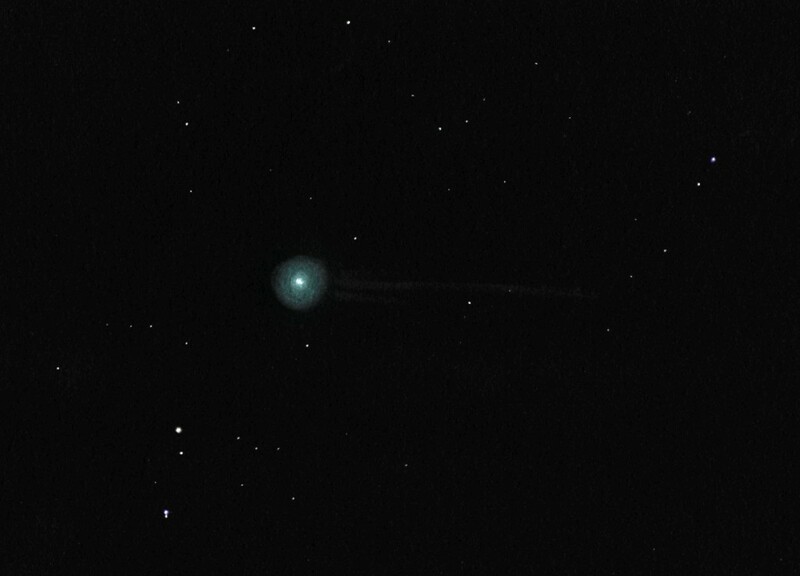 The comet was added to 4.0 Mg looking perfectly at first sight from my observatory sky quality round the Mg 6 in visual. It seems that today I have been very lucky as finished translating the comet on paper already started to get cloudy. As you will see the comet is drawn on a star chart GUIDE 9.0 because I do not like to draw so many stars when what I want is to capture a comet. During the “Charlie Hebdo” event we had to keep the pencil in hand, to prove that life goes on and is beautiful and that cretinism can’t win, ever. Today, poverty of spirit associated with force no longer have a voice in civilized countries ! 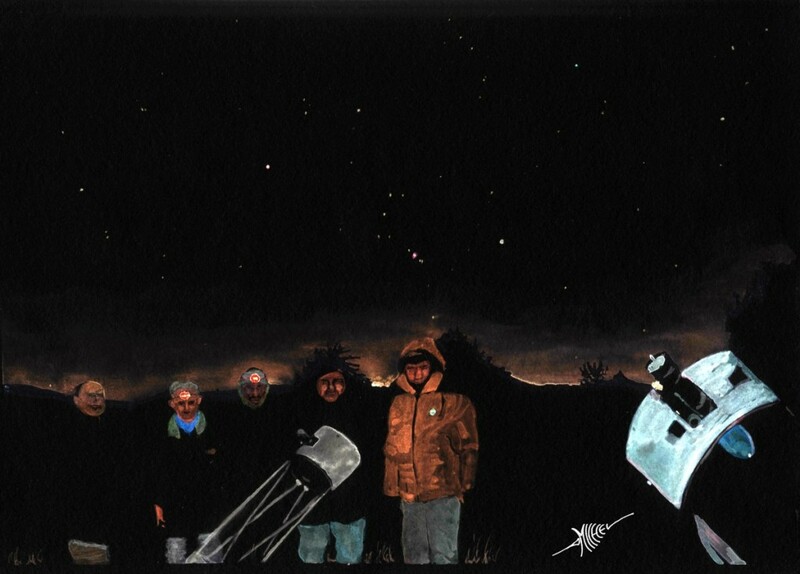 Four of my good friends astronomers propose to come and enjoy the dark sky of the region. Appointment is made on 8 January in the early evening. The day before I found a good ground for observing this beautiful comet without too many trees in the view. Near the small village of Saint-Laurent, a platform overlooking the north side of the Lake of Artignosc on the Verdon river. First I will make some sketches and (yes I know… sorry guys) photographs of the landscape and material that will serve my watercolor the day after. 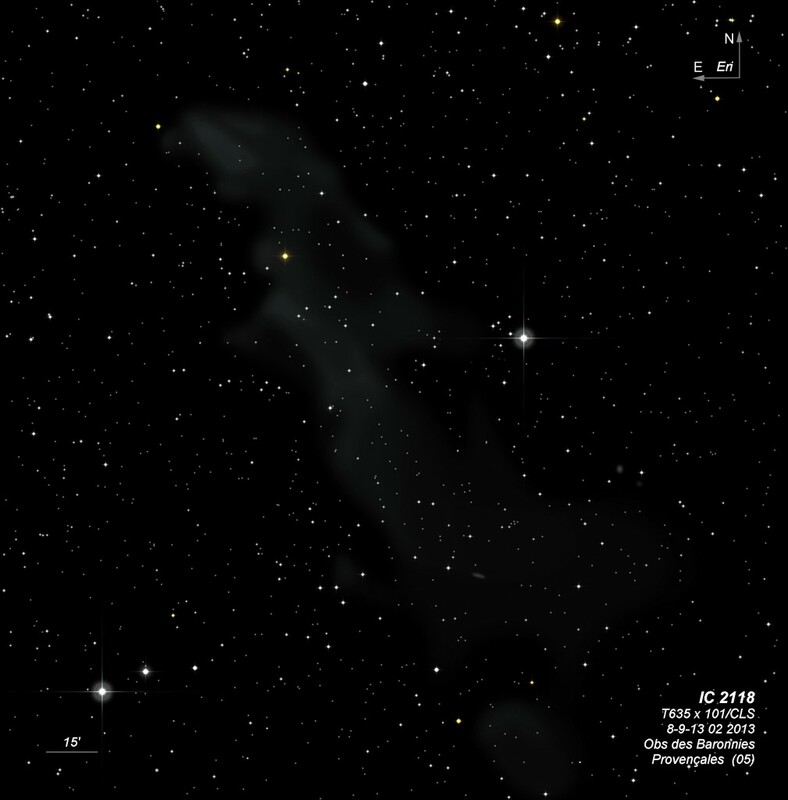 The photo of the sky taken on Jan. the 7th (Pentax K50 3.5 – 3sec 25600 ISO -18mm) shows the comet as a brillant green star equivalent magnitude to Pi ORI +/- 4.0. But I’m not here to make photo ! it just allow me to position the stars on the sky background on my future painting. The evening of Jan. 8th everyone is there, my friends Vincent, Antoine, Yvan and Jean-Bernard, made the trip from Brignoles, La Garde, Forcalqueiret and Salon. It’s cold, the wind and the news from Paris make us shiver. The comet is visible to the unaided eye, even in direct vision. During the previous night, a tail departure was barely noticeable in my Dobson 12ˮ f 5. 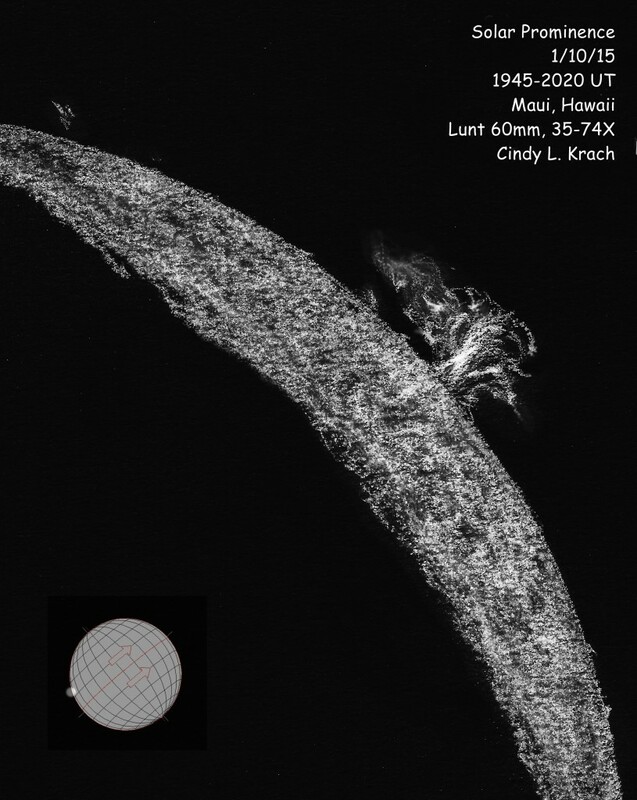 Today we are three of us observing a double tail, a very short first part is attached to the hair while another, a sort of fine filament spreading further. It was extremely difficult to see that tail, face this huge ball of light that is the coma of Comet Lovejoy. Through a set of 2ˮ filters provided by Vincent (CLS, OIII, UHC) we got to see something other than the coma. 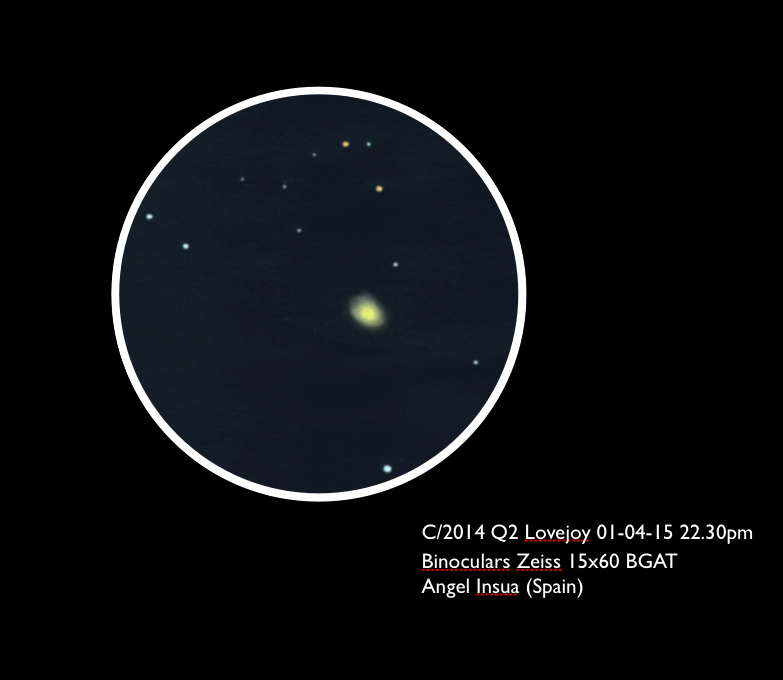 This is strangely due to the CLS filter that we have been able to detect some clarity in front of the dark sky. We had to get the coma out of the eyepiece to discern the low-contrast gradient between the black sky and the thin clouds of the tail. We are here at the border of the possibilities for the vision. Dobson used was a 12ˮ f/d 5 and 2ˮ eyepieces Meade 24mm to Omegon 38mm, UWA. We deployed 80mm and 150mm refractors as well as quality binoculars: Echo and Swarovski. 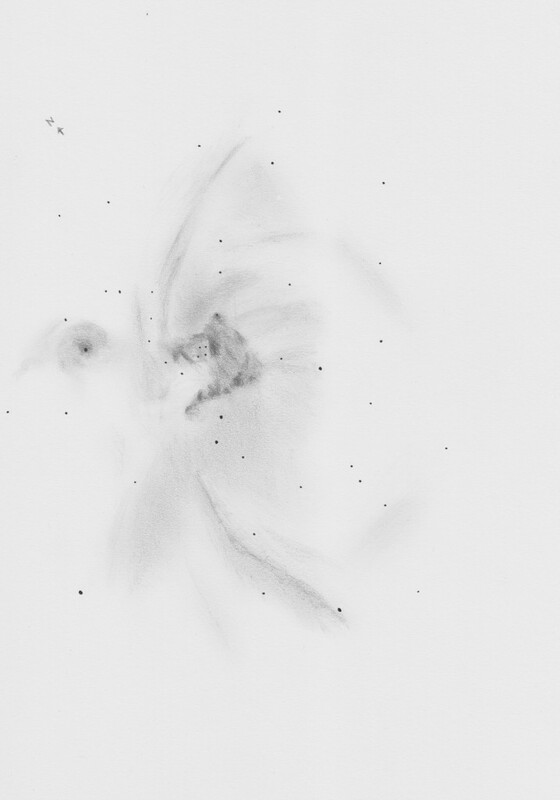 The watercolor shows our group gathered for this “Lovejoy expedition” after two hours of dense observation. So the final watercolor shows the views of the sky the day before, a view of the Dobson and -with a flash- portraits taken by the Vincent’s camera. Observing is also meeting us for the same vibration, the same enthusiasm, and that night it was … it was … there was … something strong in the air! Finally I was able to observe the comet that is in our sky. Lovejoy Comet appears like a planetary nebula with a central star (nucleus). I found it very bright, but I saw no tail. I used my dobsonian telescope 10″ f/5 and an eyepiece of 14mm 82°. 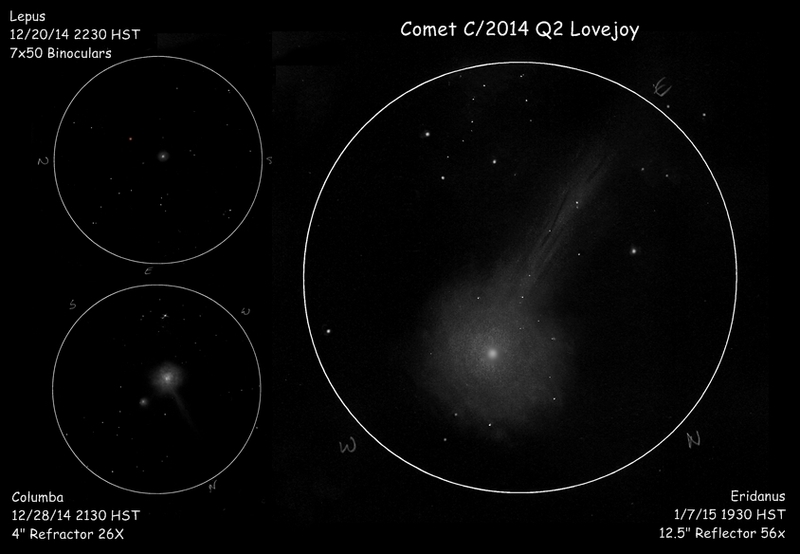 Like many astronomy enthusiasts I have been following the comet C/2014 Q2 Lovejoy. I present to you a montage of sketches beginning with binocular views and progressing to higher magnification as the comet moved through the sky. 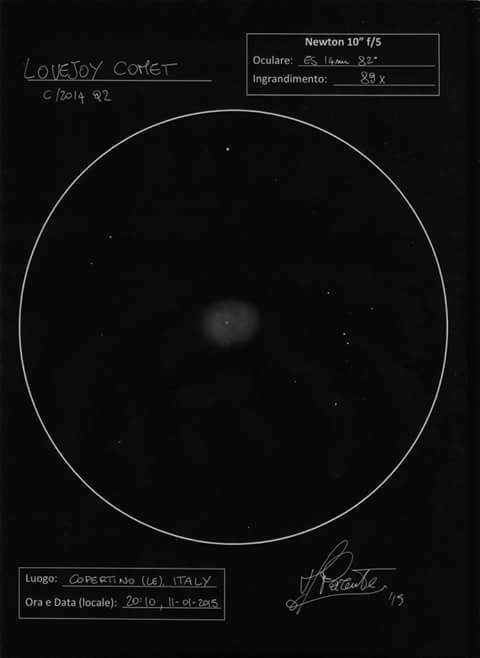 The first sketch in binoculars on 12/20/14 showed the bright yellow/ orange star Kappa Columba in the same field of view as the comet. 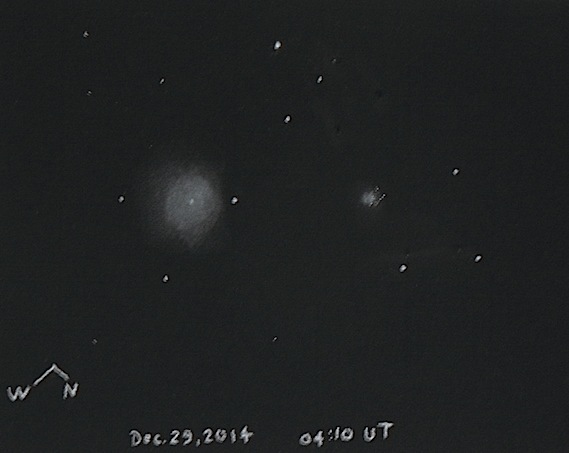 On 12/28/14 the close proximity to M79 made for a special observation in my 4” refractor. 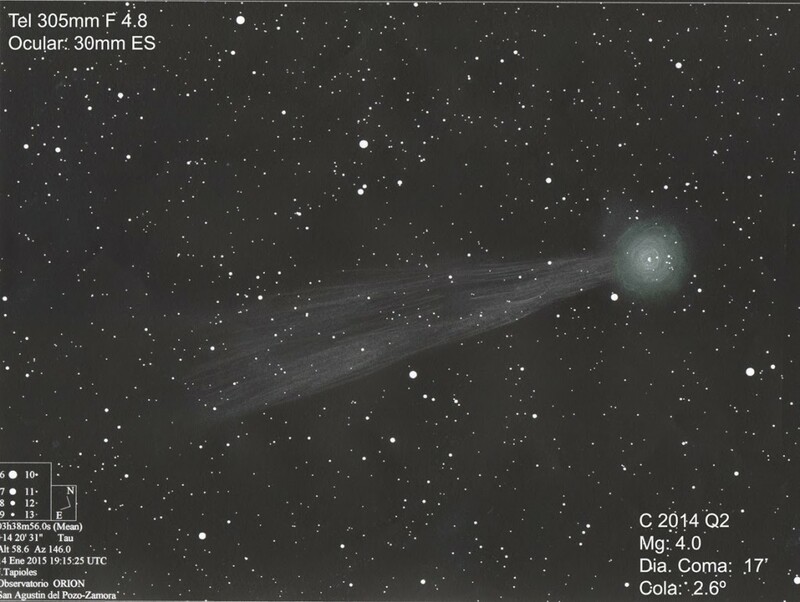 In the last sketched observation on 1/7/15 in the 12.5” reflector I was taken aback by the sheer size of the comet, also at its brightest at this time with light and dark streaking visible in the tail. Beautiful to behold at any magnification. 12/20/14 to 1/7/15, all times listed are Hawaii Standard Time. 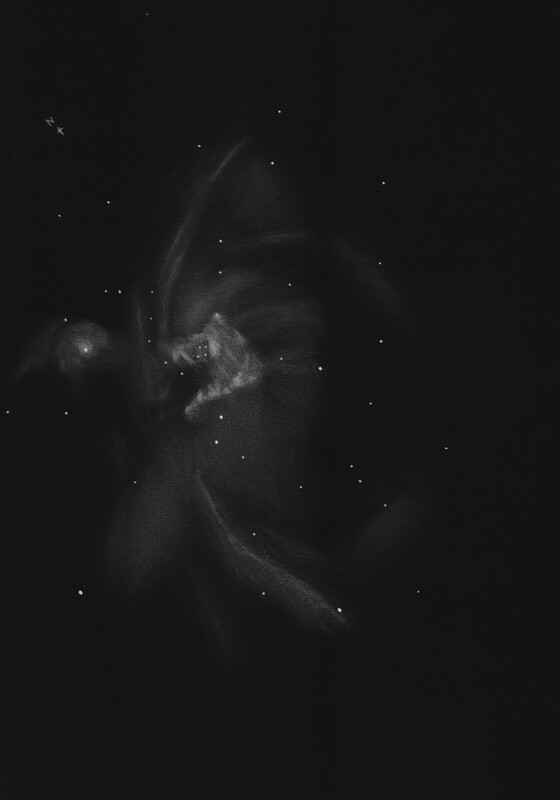 With the GIMP and inverted color and have given color to any star. Pleasant evening with cold and good company. 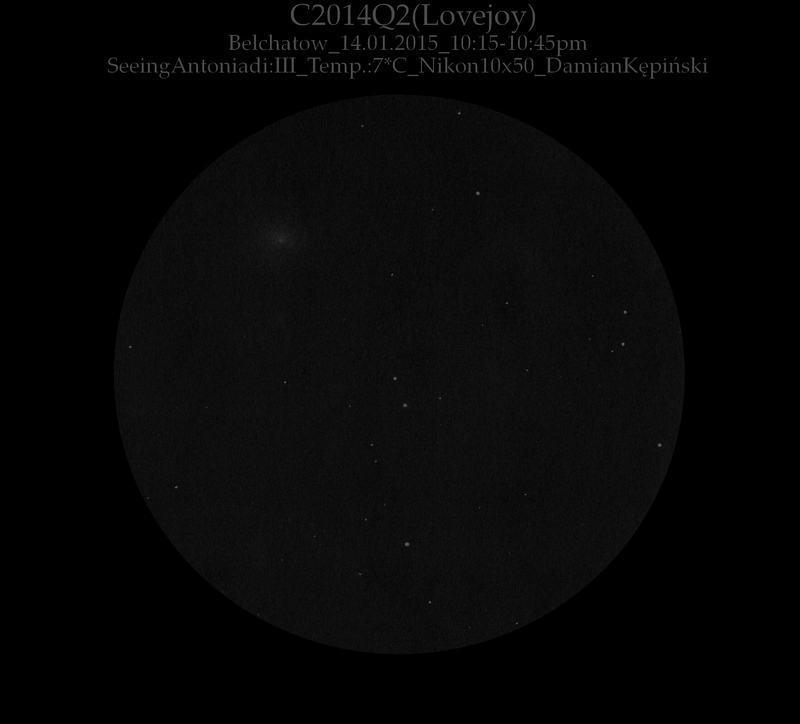 I got the comet C/2014 Q2 (Lovejoy) from Norway, Trondheim. and no tail. Info on my sketch! I used pencil and inkpen on white paper (inverted). Hope you enjoy my sketch and observation! I wish you all happy new year and clear skies!! During the early part of the current lunation I was observing and sketching in Mesa, Arizona and caught the thin crescent Moon in the southwestern sky just after sunset. Venus was also visible much closer to the horizon but not close enough to the Moon to be included. Earthshine improved and brightened as the hour passed. For this sketch I used dark blue sketching paper (8.5” x 11”), white, yellow and brown pastel pencils, blending stumps, white Pearl eraser. 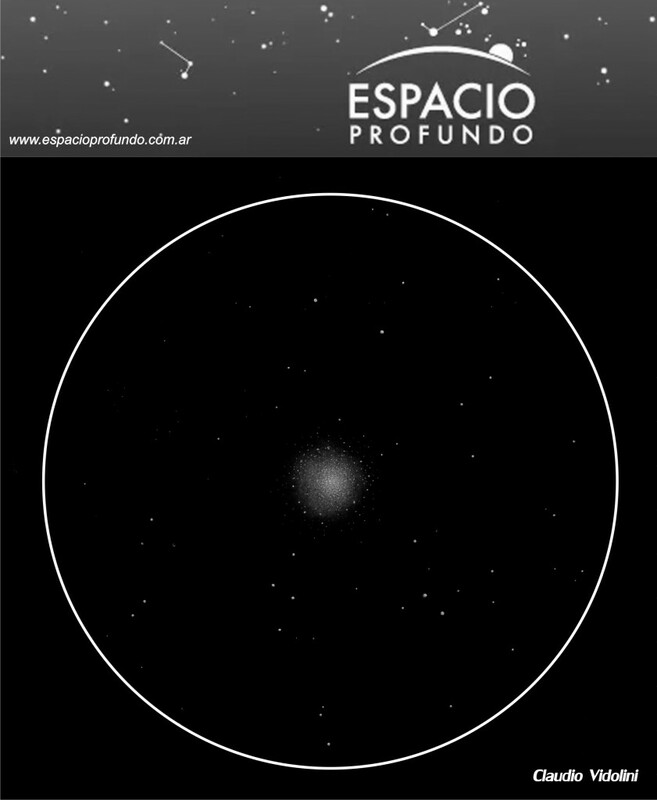 This is an internal challenge the forum espacioprofundo.com.ar , astronomical section drawing, in which it was proposed to draw a globular cluster choice and these are the results. The credit of this picture is for Leandro Yasutake, Claudio Vidolini and Martin Boni, and we are representing espacioprofundo.com . The three drawings were made in different parts of Argentina. 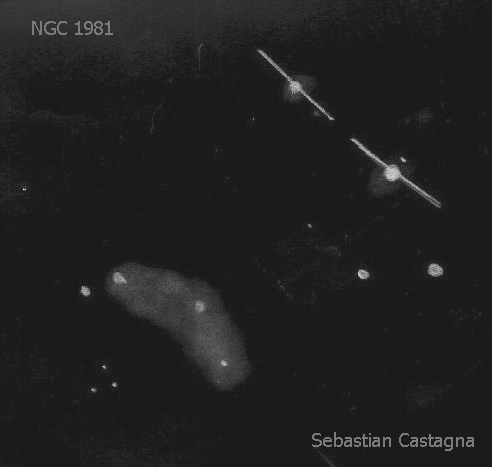 The first (NGC 2808) was held in San Miguel, Buenos Aires. 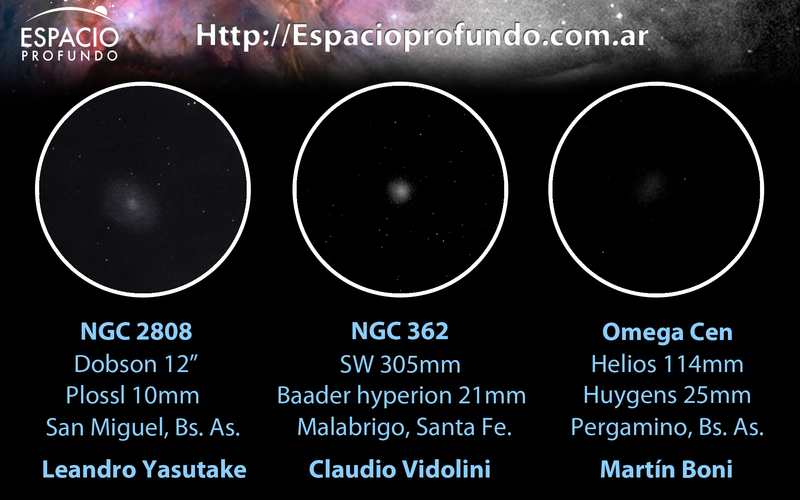 The second (NGC 362) in Malabrigo, Santa Fe; and the third (Omega Cen) in the town of Pergamino, Buenos Aires. Este es un desafío interno del foro espacioprofundo.com.ar, de la sección de dibujo astronómico, en el que se planteó dibujar un cúmulo globular a elección y estos son los resultados. El crédito de esta imagen es para Leandro Yasutake, Claudio Vidolini y Martín Boni, y estamos en representación de espacioprofundo.com. Los tres dibujos fueron realizados en lugares diferentes de Argentina. El primero (NGC 2808) se realizó en San Miguel, Buenos Aires. El segundo (NGC 362) en Malabrigo, Santa Fe; y el tercero (Omega Cen) en la localidad de Pergamino, Buenos Aires. 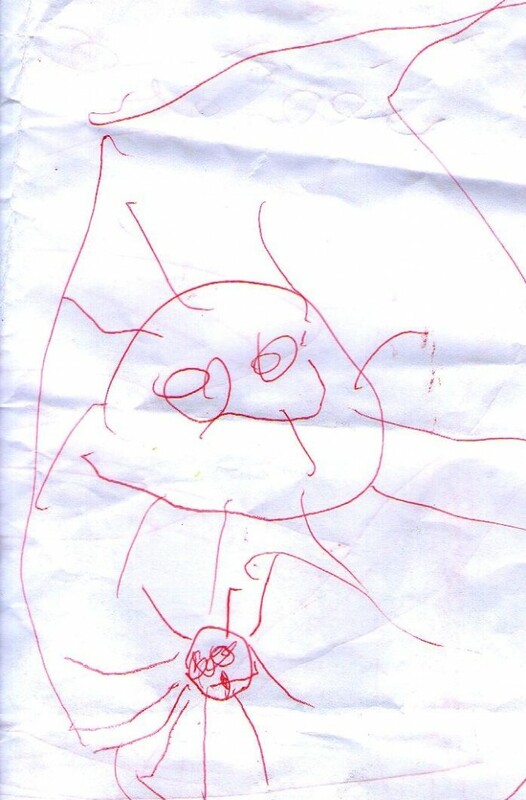 Soy padre de gemelos, Eugenia y Luciano, ellos tienen tres a años y medio, este es el primer dibujo de Eugenia, es la primera figura que se distingue como algo. Como padre y amante de la Astronomia, todos los fines de semana, hacemos observaciones Soleres como tambien observamos la Luna. Eugenia, le agrada dibujar y Luciano le encanta observar por el telescopio, realmente lo disfruta. El equipo que utilizamos, es un refractor Skytravel 80-400 AZ3, para la observacion Solar, utilizo un filtro Solar Baader , BST 12 mm y un filtro # 21: Para la observacion Lunar utilizamos un bst 12mm con filtro #ND96. I am a father of twins, Eugenia and Luciano, they have three and a half years, this is the first sketch of Eugenia. As a parent and lover of Astronomy, every weekend, we make observations o Sun as also observe the Moon. Eugenia, likes to draw and Luciano loves observing through the telescope, really enjoys it. The equipment we use is a refractor Skytravel 80-400 AZ3, for solar observation, I use a Baader solar filter, BST 12 mm and a filter # 21: To the observation Lunar bst use a 12mm filter # ND96. 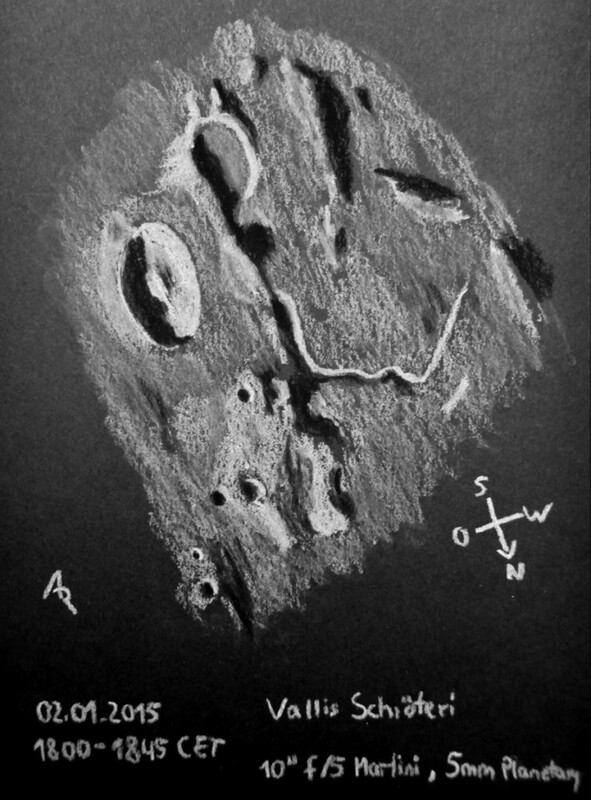 find attached a charcoal and pastel sketch of Aristarchus, Herodotus and the famous Vallis Schröteri. I hope you like it. Location: A Coruña, Galicia. Spain. Media: pencil, white paper, color invert and enhance with Gimp. SeeIng: 3/5 (good). Intense moonlight. 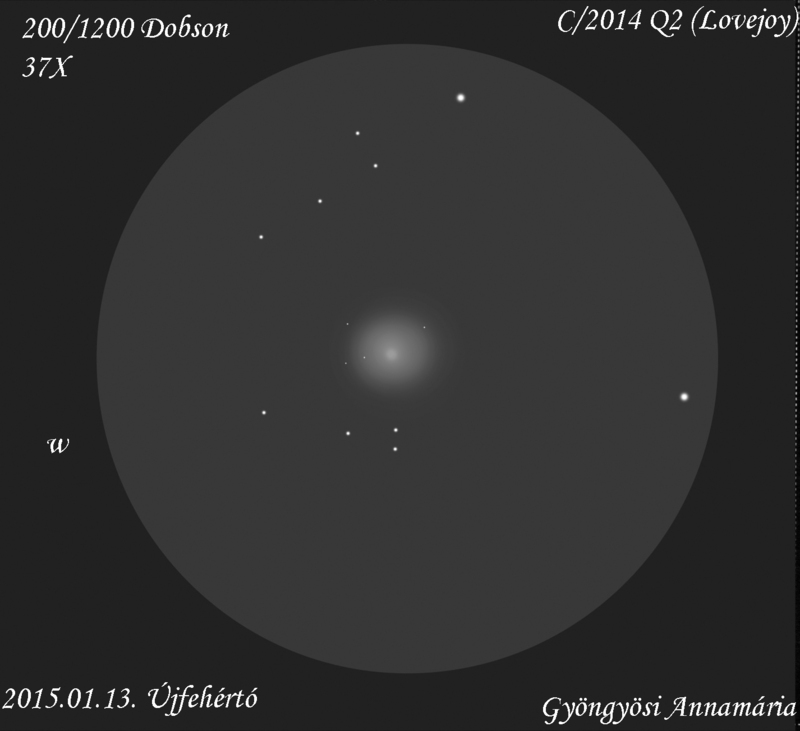 This is my drawing of Lovejoy comet. I couldn´t see the tail of the comet because a full moon was shining. It was a very pleasant view the contrast between yellowish colour in the comet, the orange stars HR 1451 and HR 1452 and the white-greenish light from the HIP 21258. 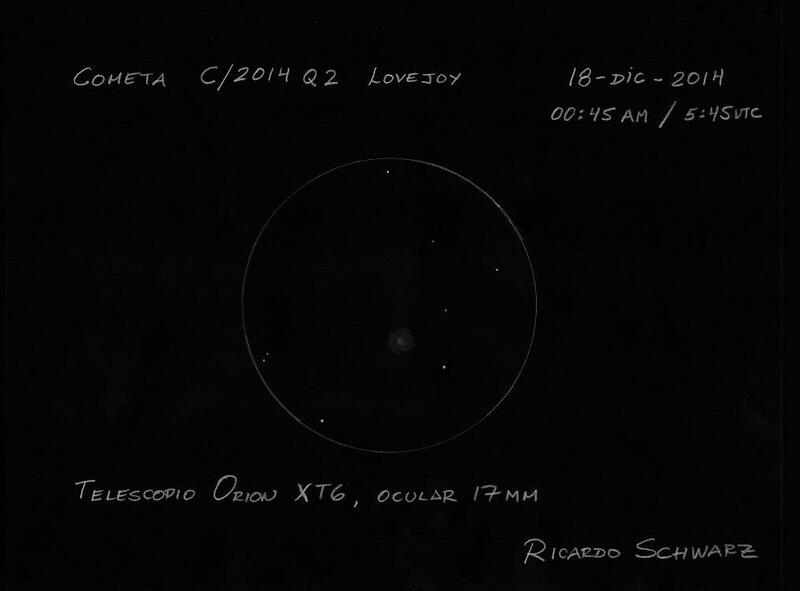 Este es mi dibujo del cometa Lovejoy. No he podido observar la cola del cometa, la observación se hizo con una intensa luz lunar. 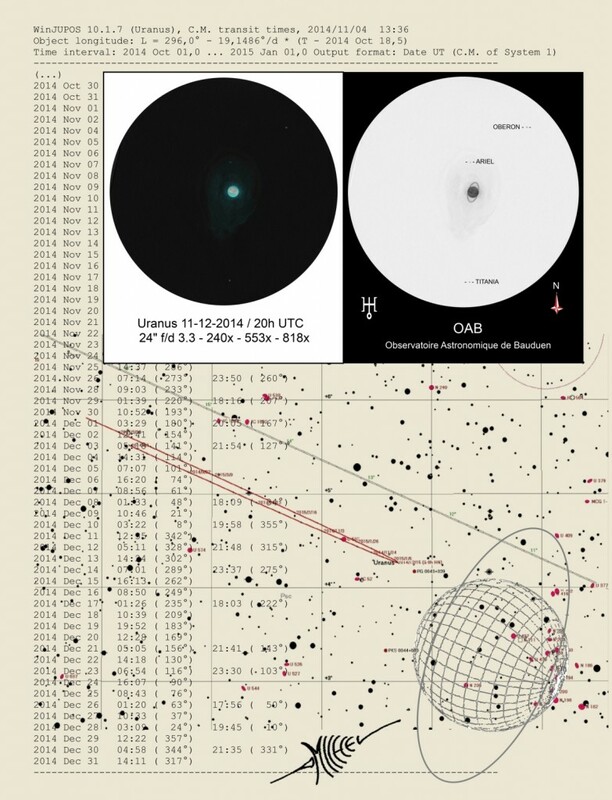 Lo más placentero de la observación ha sido el contraste entre el color amarillento del cometa y la luz anaranjada de las estrellas HR 1451 y HR 1452 frente al color blanco-verdoso de la estrella más pequeña HIP21258. 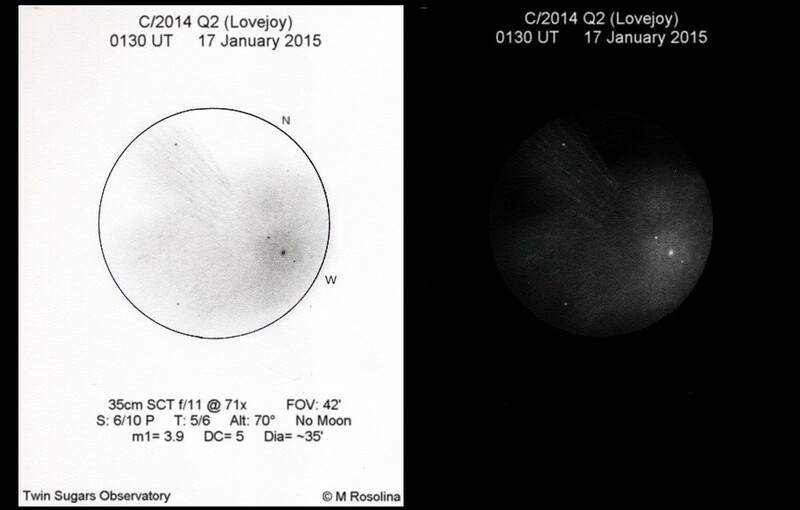 I have been monitoring comet Lovejoy (C/2014 Q2) for the past several nights and on this occasion they both shared the same field of view at130 power. 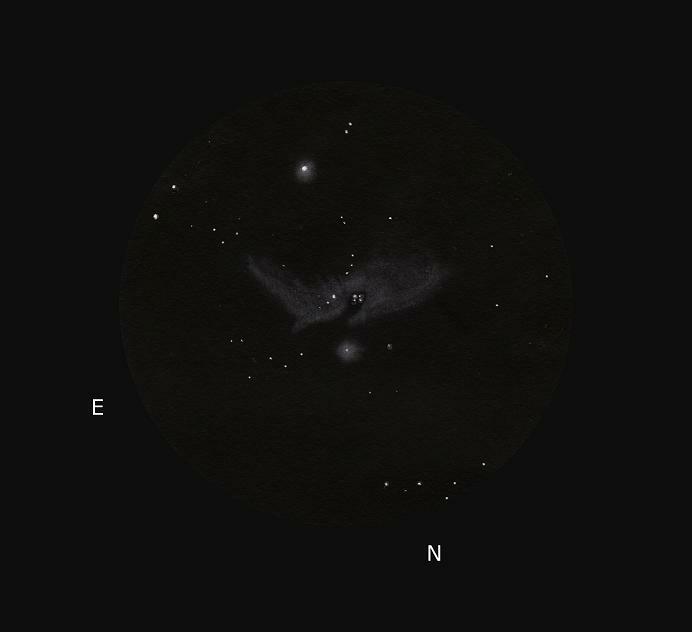 I was using my daughter’s 10 inch Orion Dobsonian telescope and was able to capture this sketch under clear skies and good seeing conditions. The observation site was in eastern Mesa, Arizona with a good view to the south. The comet can be seen much brighter and larger in angular size than than 8.5 magnitude globular cluster M 79. This was a pleasing view at the eyepiece with the comet showing a hint of green color. I switched to 48 power and a wider field of view for the sketch. R.A. 05hr 24′ ; Dec. -24 degrees 33min. Comet distance less than 100million km. So far this winter is terrible for astronomy. Nothing but clouds and rain in the Netherlands… But yesterday evening the skies finally cleared and my 3″ Polarex Unitron was quickly set up in the backyard. Crater Pythagoras on the northeastern limb of the Moon looked particularly nice – like a deep rocky bowl in the lunar surface. Seeing conditions were fair, so I pumped up the magnifcation to a crazy (for a 3″) 200x. 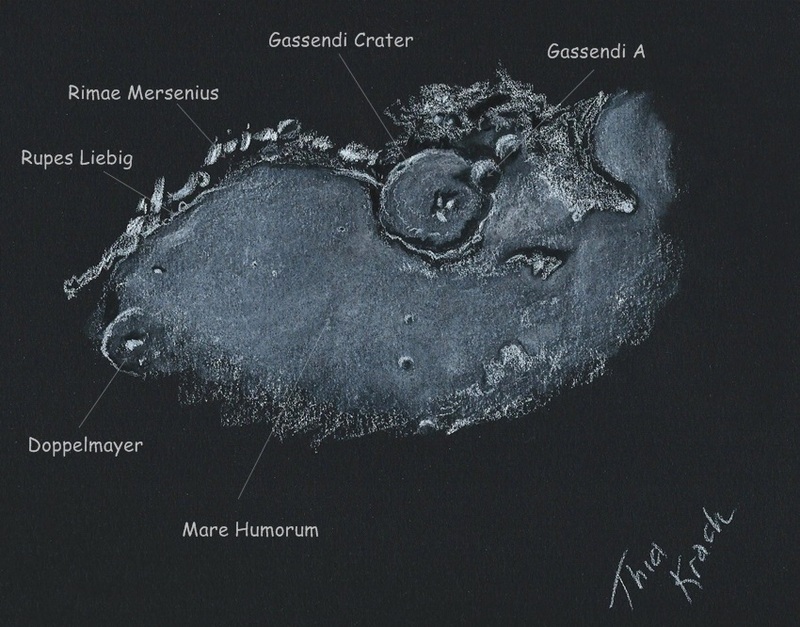 It still gave a pleasant and sharp view and sketching was quite comfortable with the crater looking big in the eyepiece. 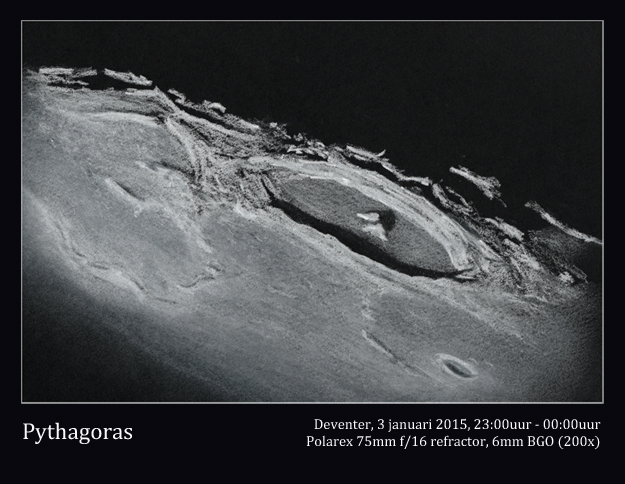 Pythagoras is a 130km wide impact crater with staggering 5km high terraced walls. The central peaks (I could see two of them) are also pretty huge: 3,5km high! Imagine the panoramic view from the top op one of those mountains…. 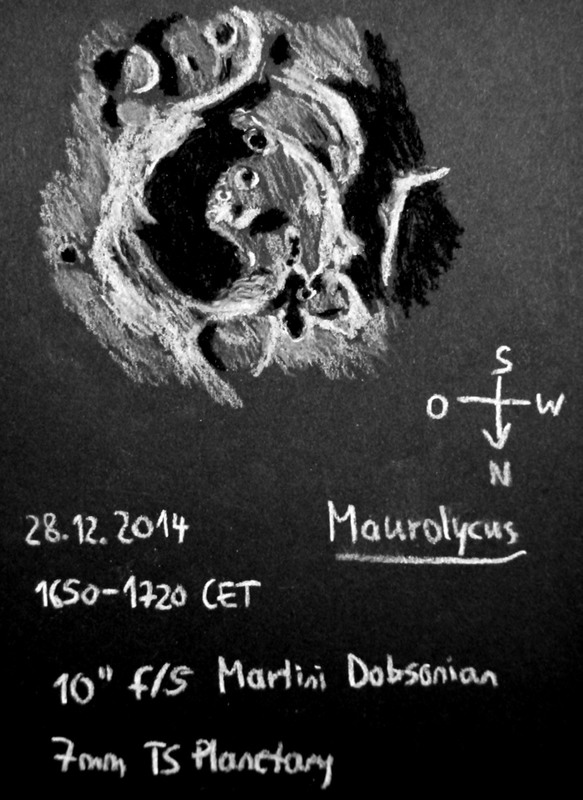 Sketch made with a pastel pencil on black paper, through a 3″ Polarex Unitron at 200x (Baader 6mm BGO). The image is mirror reversed. 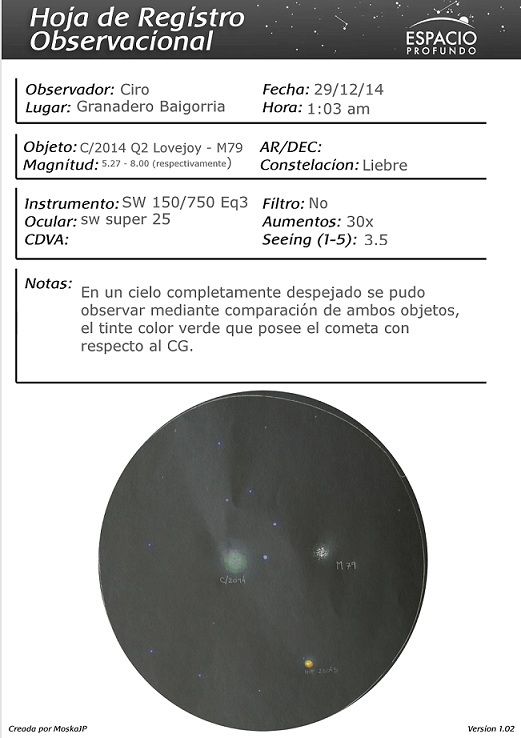 Conjunción del cometa Lovejoy con el cúmulo globular M79, en la constelación de la liebre. El equipo con el cual se realizo la observación es un telescopio reflector sw 150/750 con un ocular de 25. Comet Lovejoy conjunction with the globular cluster M79 in the constellation of the hare. The equipment with which the observation was performed is a reflecting telescope with an eyepiece 150/750 sw 25. Media: graphite pencil , white paper and Phto Zone to invert, color tone and text. Telescope: Meade Coronado PST – H alpha, 40/400. Equipo: Refractor Acromático Bresser Messier 152L 1200mm; F/7.8. Montura: HEQ5 Pro. 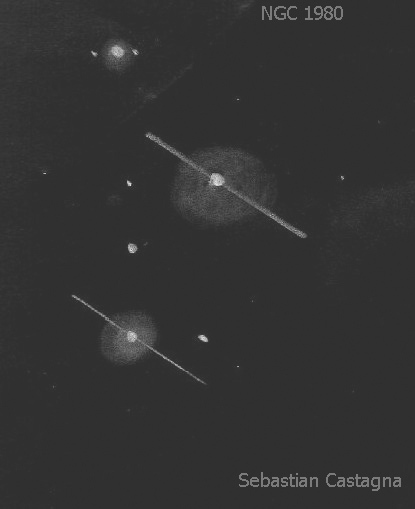 Ocular: WO 2″ 25mm 48X. Team: Achromatic Refractor Bresser Messier 152L 1200mm; F / 7.8. Frame:. HEQ5 Pro Ocular: WO 2 “25mm 48X. Every Christmas Eve, my family treks to the top of Haleakala to feel the chill and look for Santa’s Sleigh. This year we went to the 10,000 el to find it a cold 36*, wet, and blowing rain. After a few minutes we jumped back into the car a bit disappointed, to descend the mountain. Right before the park exit the sky had mostly cleared and the winds calmed. There we hiked under the “smiling” Hawaiian crescent. Chilled cheeks and fingers, it was perhaps one of the nicest Christmas Eves ever. This sketch was drawn from my memory of the evening. In the winter months the path of the Moon is more parallel with the horizon giving the lunar crescent in Hawaii a bowl or smile like appearance when lit from the already set sun. Ancient Hawaiian’s called this the “wet moon” because it looks like a bowl that could be filled up with rain. As the winter moves into Spring & Summer the crescent shifts to “pour” water onto the land, empties and becomes a “dry moon” once more. 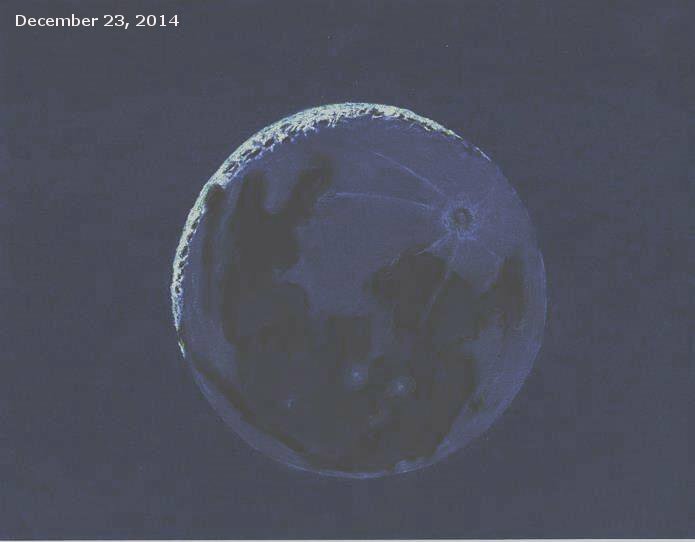 Wet moons occur routinely in the tropics where the sun and moon rise and set nearly vertically. Webmaster’s note: Wishing all astrosketchers a Very Happy New Year and looking forward to another year hosting all your wonderful observational sketches! here we go with a chalk/charcoal sketch of lunar crater Maurolycus. Here’s the sketch I made while looking at this galaxy. The mag. estimation I did is far better than expected : 11.2. A target easy to find because the galaxy NGC 4666 is quite big and very close to gamma Virgo with a confortable magnitude, but the SN is very close to the galactic centrum, only 12 sec of arc! !, so to separate the two lights the use of the 24″ helps a lot. Just started the winter solstice and wanted to celebrate it! The humidity is very high but its clear and I can see lot of stars south of CMa … looks like I’ll be lucky. 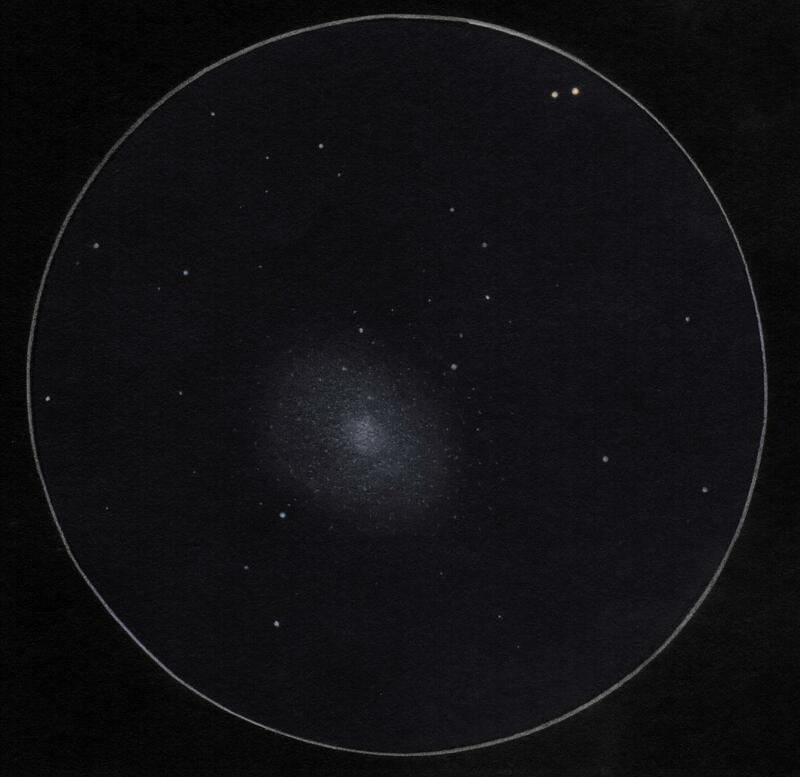 The field of binoculars is beautiful, the comet is framed in a triangle of stars and I can see a thin tail with indirect vision that goes north. It’s longer than I expected to see, I make a mark on the picture to know the length of the tail I see (arrow). 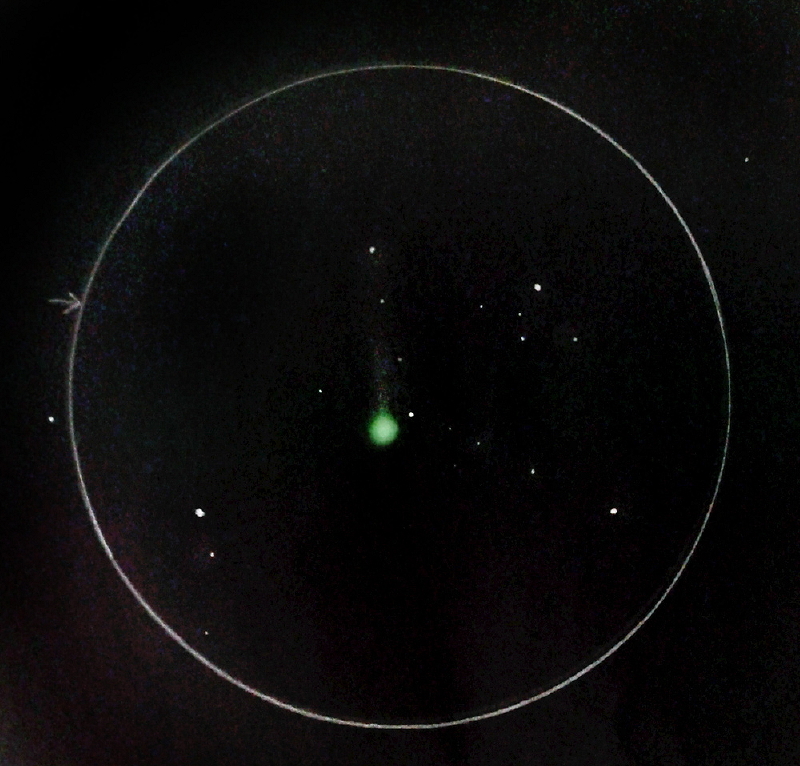 I make a drawing with the position of the comet and the reference stars and the size of the coma and tail to the correct scale I see. Graphite (H, HB) and difumino on white paper, scanned and inverted. Location: Malabrigo, Santa Fe, Argentina. Media: White paper, pencil HB and GIMP to invert colors and make minor tweaks. Equipment used for the drawing: Dobson SkyWatcher 12″ (305 mm). Power: 70x, with Baader Hyperion 21 mm. Location: San Miguel, Buenos Aires Argentina. Conditions: Good transparency, bad seeing. Media: 2B, 2H, blend stump and PS. Averted vision. Eyepiece: Plössl 10mm (x152) . That’s maybe because I like to use this great telescope, or it’s because I like challenges but,… it’s certainly not the best optical combination for this observation. 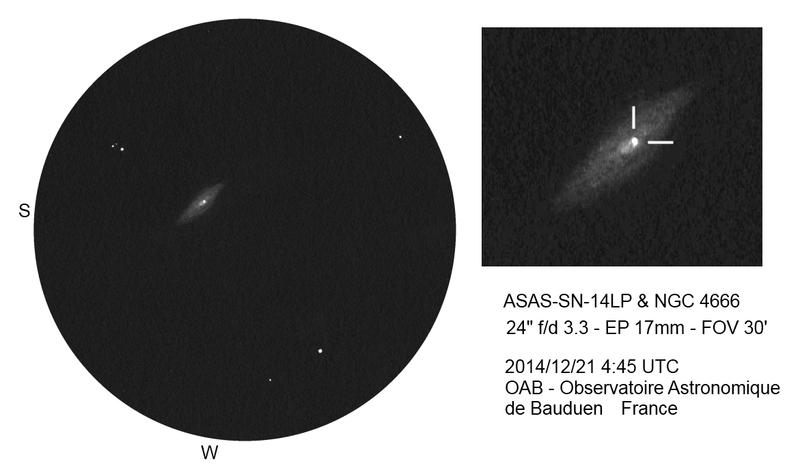 On 11 December, I finally found a corner of pure sky above the 24-inch reflector made by Olivier Planchon. To observe Uranus, the speed is definitely too high: f / 3.3 d, so we had to use very short focal EP to reach the useful magnification (Nagler 3.7 and 2.5) !. 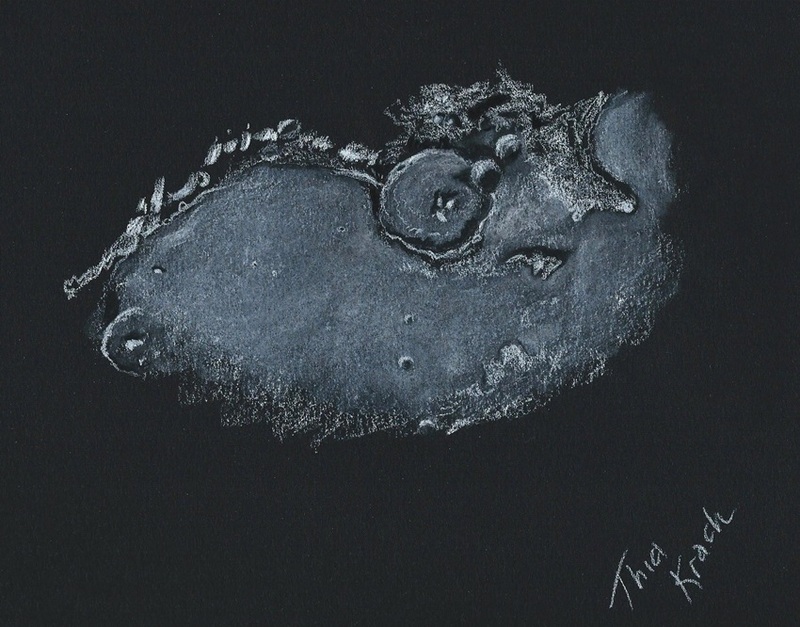 If you look at my watercolor you can see a somewhat elongated comet hair that diffuse around the planet, that’s exactly how we see the planet area in the field, this is probably linked to a not 100% perfect collimation, but still. I get the impression that the work of collimation facing these big tubes, it is not a piece of cake. 2- the disk of the planet was not uniform as seen in a small telescope or some photos. It’s very difficult to confirm, but a diffuse zone clearer was observed in the upper atmosphere of Uranus, is that an artifact, I do not know? 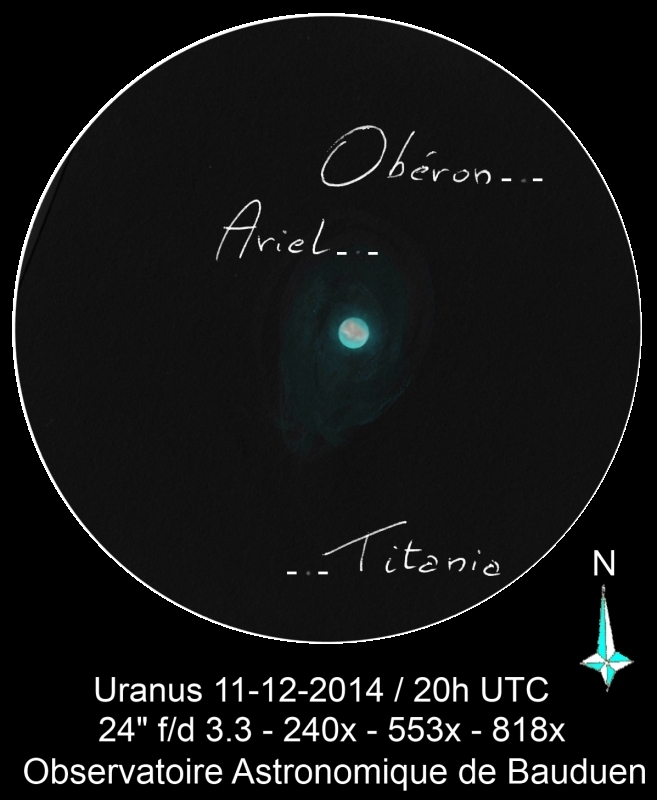 Anyway the main direction of the area is not in the direction of the cloud bands of Uranus. Media graphite pencil, white paper, digital tools. 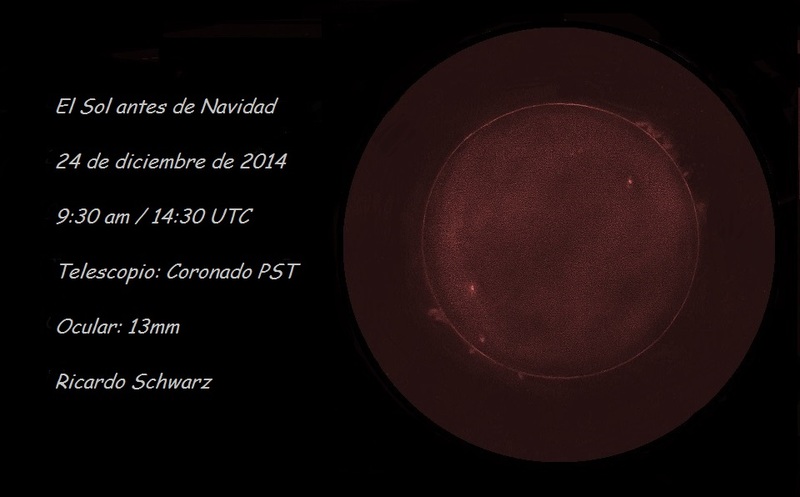 All observations be performed with a motorized telescope Eq2 130-900 refelctor and eyepieces BST 12MM (75x). Todas las observaciones ser realizaron con un telescopio 130-900 Eq2 motorizado con oculares BST 12 MM (75x). NGC 3372,”The Carina Nebula” aka “The Great Nebula in Carina” and the “Keyhole Nebula” portion of this complex emission, reflection and dark nebula. The constellation Carina alone makes it worthwhile travelling to Southern Africa – and the Carina Nebula NGC 3372 is the heart of it – especially for visual observing. NGC 3372 is studded with bright and even dark nebulae. The most impressive to me is a combination of “light & shadow” – the Keyhole Nebula (the famous “eta carina” is the bright star at lower left). 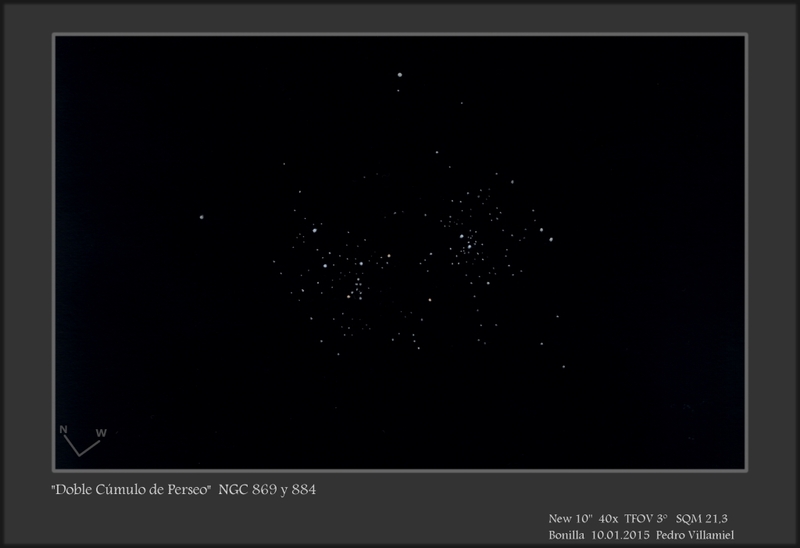 Hard to see in the skies with light pollution in the city of Panama …. but we draw the sketch. Winter arrives, and with it, all the Orion wide field. Therefore, it’s time for me to propose a drawing of an elusive object of that region: Witch’s Head Nebula, IC 2118. This observation spent on 3 nights, for an amount of a bit more of 6 hours ! power: 100x, with Nagler 31mm and CLS filter. Drawing with Paintshop Pro 7. Clear skies for all of you ! Location: Pergamino, Buenos Aires, Argentina. Media: White paper, pencil and photoshop to invert colors and make minor tweaks. Equipment used for the drawing: Helios 114/900 (reflector). This was one of those nights things just fall together. Excellent seeing and light enough from the Moon that I could see the paper well. After finishing my sketch at the eyepiece I went inside to clean it up and was pleasantly surprised that I liked it pretty much the way it was. 110km wide Gassendi Crater showed some excellent roughened floor details with hummocks casting shadows as well as floor rilles illuminated as bright & dark lines. Rima Mersenius is brilliantly lit on the terminator and the bright scarp of Rupes Liebig can be seen at the base of the wall.